Los Angeles, USA - March 08, 2012 - IBM (NYSE: IBM) scientists today will report on a prototype optical chipset, dubbed "Holey Optochip" that is the first parallel optical transceiver to transfer one trillion bits - one terabit - of information per second, the equivalent of downloading 500 high definition movies. The report will be presented at the Optical Fiber Communication Conference taking place in Los Angeles. Samuel J. Palmisano and Virginia M. "Ginni" Rometty at IBM's corporate headquarters in Armonk, N.Y., USA. Rometty, an IBM senior vice president, was elected by the IBM board of directors to become the company's president and ninth CEO on January 1, 2012. 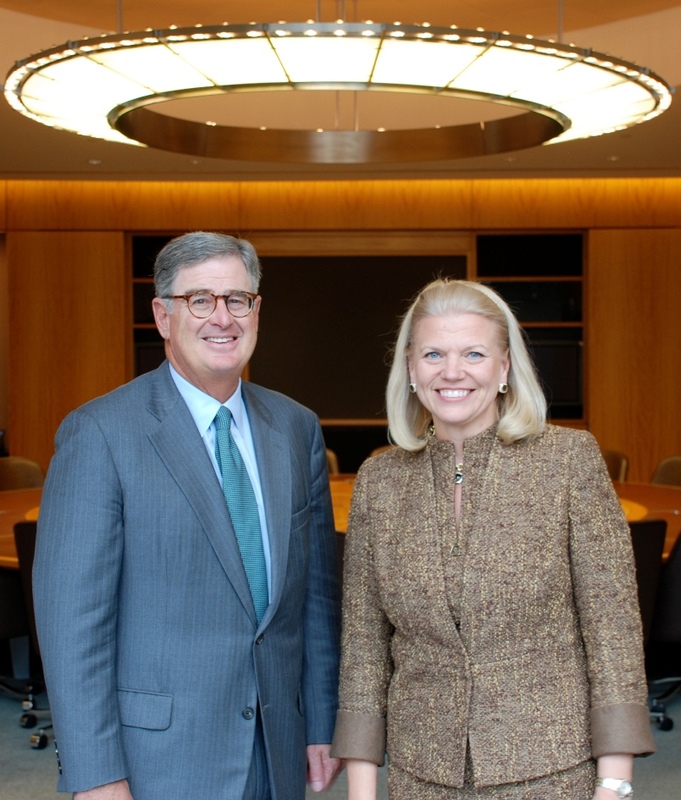 Palmisano, currently IBM chairman, president and CEO, has significantly transformed IBM. During his tenure as CEO, the company has delivered record financial performance and breakthrough innovations, such as Watson. Mr. Palmisano will remain IBM's chairman. October 25, 2011. IBM (NYSE: IBM) scientists today will report on a prototype optical chipset, dubbed “Holey Optochip”, that is the first parallel optical transceiver to transfer one trillion bits – one terabit – of information per second, the equivalent of downloading 500 high definition movies. The report will be presented at the Optical Fiber Communication Conference taking place in Los Angeles. With the ability to move information at blazing speeds – eight times faster than parallel optical components available today – the breakthrough could transform how data is accessed, shared and used for a new era of communications, computing and entertainment. The raw speed of one transceiver is equivalent to the bandwidth consumed by 100,000 users at today’s typical 10 Mb/s high-speed internet access. Or, it would take just around an hour to transfer the entire U.S. Library of Congress web archive through the transceiver. Progress in optical communications is being driven by an explosion of new applications and services as the amount of data being created and transmitted over corporate and consumer networks continues to grow. 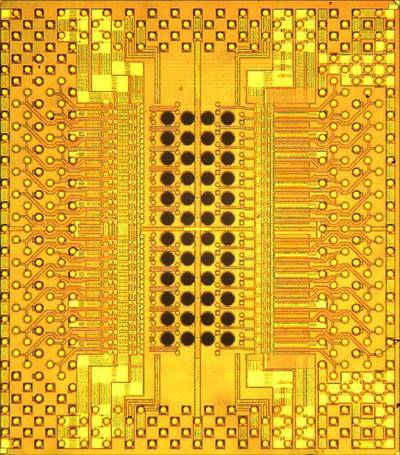 At one terabit per second, IBM’s latest advance in optical chip technology provides unprecedented amounts of bandwidth that could one day ship loads of data such as posts to social media sites, digital pictures and videos posted online, sensors used to gather climate information, and transaction records of online purchases. Photomicrograph of IBM Holey Optochip. Original chip dimensions are 5.2 mm x 5.8 mm. “Reaching the one trillion bit per second mark with the Holey Optochip marks IBM’s latest milestone to develop chip-scale transceivers that can handle the volume of traffic in the era of big data,” said IBM Researcher Clint Schow, part of the team that built the prototype. Optical networking offers the potential to significantly improve data transfer rates by speeding the flow of data using light pulses, instead of sending electrons over wires. Because of this, researchers have been looking for ways to make use of optical signals within standard low-cost, high-volume chip manufacturing techniques for widespread use. Using a novel approach, scientists in IBM labs developed the Holey Optochip by fabricating 48 holes through a standard silicon CMOS chip. The holes allow optical access through the back of the chip to 24 receiver and 24 transmitter channels to produce an ultra-compact, high-performing and power-efficient optical module capable of record setting data transfer rates. The compactness and capacity of optical communication has become indispensable in the design of large data-handling systems. With that in mind, the Holey Optochip module is constructed with components that are commercially available today, providing the possibility to manufacture at economies of scale. Consistent with green computing initiatives, the Holey Optochip achieves record speed at a power efficiency (the amount of power required to transmit a bit of information) that is among the best ever reported. The transceiver consumes less than five watts; the power consumed by a 100W light bulb could power 20 transceivers. This progress in power efficient interconnects is necessary to allow companies who adopt high-performance computing to manage their energy load while performing powerful applications such as analytics, data modeling and forecasting. By demonstrating unparalleled levels of performance, the Holey Optochip illustrates that high-speed, low-power interconnects are feasible in the near term and optical is the only transmission medium that can stay ahead of the accelerating global demand for broadband. The future of computing will rely heavily on optical chip technology to facilitate the growth of big data and cloud computing and the drive for next-generation data center applications. Parallel optics is a fiber optic technology primarily targeted for high-data, short-reach multimode fiber systems that are typically less than 150 meters. 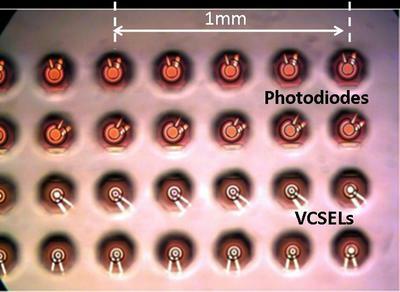 Photomicrograph of the back of the IBM Holey Optochip with lasers and photodectors visible through substrate holes. Parallel optics differs from traditional duplex fiber optic serial communication in that data is simultaneously transmitted and received over multiple optical fibers. 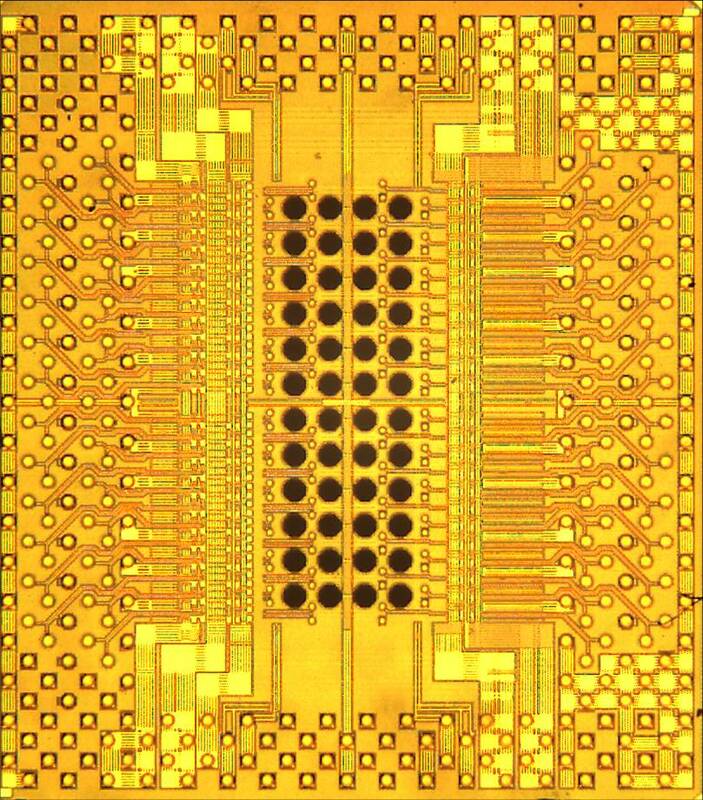 A single 90-nanometer IBM CMOS transceiver IC with 24 receiver and 24 transmitter circuits becomes a Holey Optochip with the fabrication of forty-eight through-silicon holes, or “optical vias” – one for each transmitter and receiver channel. Simple post-processing on completed CMOS wafers with all devices and standard wiring levels results in an entire wafer populated with Holey Optochips. The transceiver chip measures only 5.2 mm x 5.8 mm. 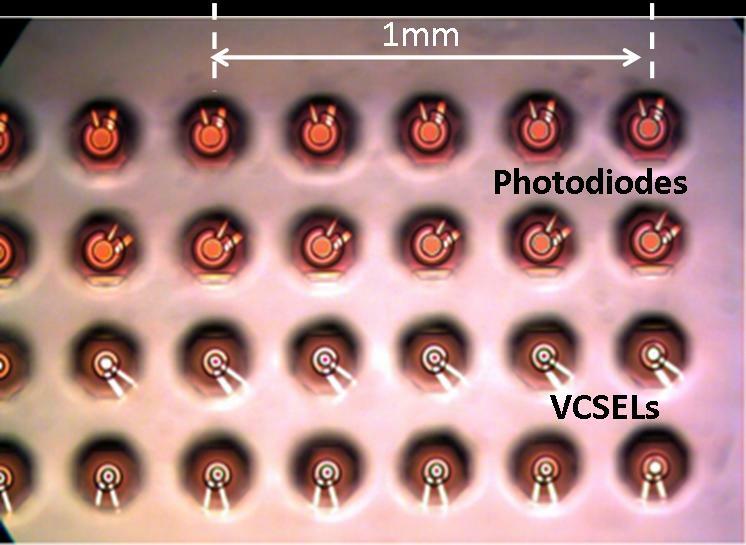 Twenty-four channel, industry-standard 850-nm VCSEL (vertical cavity surface emitting laser) and photodiode arrays are directly flip-chip soldered to the Optochip. This direct packaging produces high-performance, chip-scale optical engines. The Holey Optochips are designed for direct coupling to a standard 48-channel multimode fiber array through an efficient microlens optical system that can be assembled with conventional high-volume packaging tools. • Two optical links that are the most power efficient ever reported. Underpinned by a novel receiver design, a complete single-channel VCSEL based link achieved 15Gb/s operation while consuming only 20 miliwatts of power. This represents the first practical demonstration of an optical interconnect that attains the efficiency levels that will be required for exascale computers circa 2020. • A complete single-channel 40 Gb/s VCSEL-based optical link that not only sets a new benchmark for speed, but also operates at this high data rate with significant margin. Transmitter pre-distortion for end-to-end link performance improvement, an equalization technique that IBM has pioneered, enabled this breakthrough.